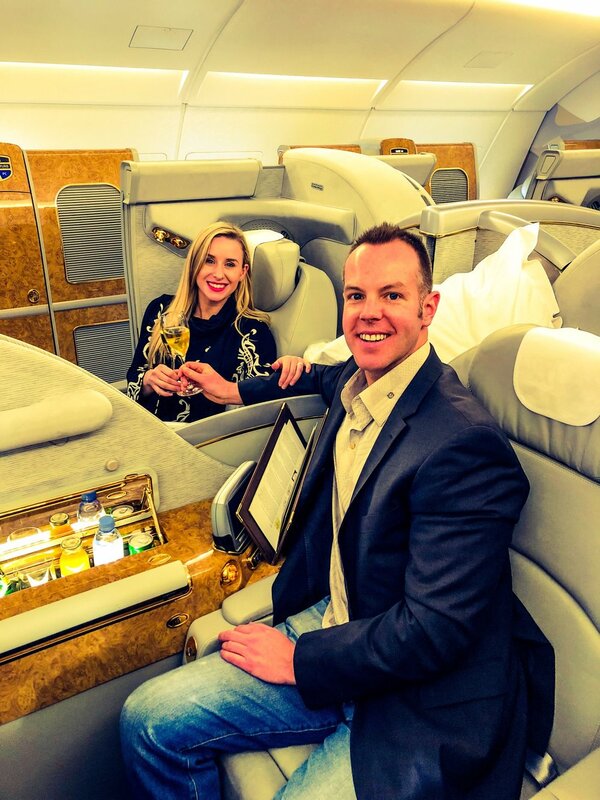 It was a marvelous flight to Dubai flying First Class on Emirates Airlines. Several months in the making, I wanted to present my food and wine review of my Emirates First Class Flight which was flown from Barcelona to Dubai. I found check-in to be very fast and we were given access to fast track security which sped up the process. I imagine that fast track option saved us more than five minutes going through security. Once we were through security we had a difficult time finding our lounge, the Sala Miro lounge, shared by many other airlines. The lounge was a bit overcrowded but had many food items and drinks. No fine wine though. We settled for a glass of the 2017 CUNE Rose (WWB, 88) as we waited for our flight. We eagerly awaited boarding our Flight 186 to Dubai. The Nespresso machine was a nice touch as you could sample different espressos while waiting. The Barcelona airport had a separate boarding area for first class passengers upstairs as we had a double decker plane, the famed Airbus 380. First class was located in front of the plane and business class was in back with the bar being all the way in back. Boarding was delayed and began at 3:45 after our scheduled 3:30 departure. We were immediately greeted by their staff. Amazingly there was one other person seated in the first class cabin. I asked for a glass of Champagne and was served the N.V. Veuve Clicquot ‘Old’ Champagne (WWB, 93) made from three different decades of wine blended in. It was the perfect refreshment. They mentioned that they were not able to serve the first class drinks until the plane was airborne. I’ll readily admit that I was not impressed with our initial server’s attitude and they switched my server about one hour into the flight. The coffee service was the perfect pick me up, made from both ground coffee beans and middle eastern spices. It was sensationally balanced. The flight departed around 45 minutes late at 4:15. We were very excited for our dinner service, and enjoying the roughly six hour flight to Dubai. Emirates has gained an international reputation for food and wine quality in their first class cabin. Once airborne we opted for the 2009 Dom Perignon Champagne (WWB, 95) which provided an amazing lift, albeit super young. The wine shows incredible texture and viscosity and has a considerably more fresh profile with more kumquat and citrus rind than the 2006 Dom Perignon that we enjoyed while we were in Barcelona. But don’t get me wrong — the ‘09 is a true heavyhitter. The wine list was simply dazzling and I was eager sample the finest wines that I saw in the first class cabin list. The first still wine that I sampled was the stunning 2015 Chateau D’YQuem ‘Ygret’ White Wine (WWB, 97) which is a seductive blend of Sauvignon Blanc and Semillon from one of the most prestigious wineries in the world. I had only enjoyed this wine a few times in my life as it is not typically available in the Pacific Northwest. 2015 was a warm vintage in Sauternes and this shows the ripeness and intensity of this enticing vintage. The texture of the wine was downright ethereal. Nearly as good was the the beautifully aged 2006 Michael Chapoutier ‘Ermitage Blanc de l’Oree’ Hermitage (WWB, 95) which comes from a warm vintage in the northern Rhône. I loved the silky texture and buttery, honeyed flavor of this wine. The mouthfeel was stunning, as was the near minute-long finish. We began our gradual saunter onto red wines and I chose the 2006 Chateau Leoville-Poyferre (WWB, 93) which comes from a really challenging vintage in Bordeaux but the wine showed wonderful intensity and richness. I loved the chocolate undertones with this wine. Similarly, the 2008 Vega Sicilia ‘Valbuena’ Ribera Del Duero (WWB, 94) comes from difficult vintage at best but the wine displayed remarkable richness and terroir. I am always amazed how well Vega Sicilia performs in any vintage. I thoroughly enjoyed the 2004 Torres ‘Grans Muralles Conca de Barbera’ Red Wine (WWB, 94) sourced from the Catalunya region as the wine utilizes indigenous varietals that were previously thought to be extinct. This wine was insanely rich and showed wonderful intensity on the nose with beautiful blue and dark fruits with lighter chocolate undertones. This insanely good wine continued to evolve over the course of two hours, only building in viscosity and purity of fruit. For dessert I sampled both the 2007 Chateau Suduiraut Sauternes (WWB, 93) as well a fantastic aged port, the 1963 Graham’s Colheita Single Vintage Tawny Port (WWB, 93). The salinity in the .375 ML Sauternes bottle showed that the Suduiraut was evolving beautifully if not entirely ethereal at the moment. I have found several of these 2007 Sauternes to be slightly young even at more than a decade of age. The food pairings on the flight were downright amazing. One of the clear dining highlights was the pairing of the beluga caviar with canapés and the 2009 Dom Perignon. With a touch of cream, combining the salinity of the beluga caviar dish as well as the richness of this dish with the Champagne really doesn’t come any better. Another great pairing for the Dom Perignon was the roasted salmon which showed amazing texture and richness — just like the Dom Perignon. For main courses the salmon worked remarkably well with the 2006 Chapoutier Hermitage as both displayed a good degree of buttery richness. The paella was soft and well-cooked as it showed good balance with the D’Yquem ‘Ygret’ White Wine. Both matched with remarkable salinity and acidity. I loved the strong fish broth character of the paella as I can imagine this was downright impossible for them to prepare a dish of this high level of culinary quality on an airline. Pairing the slow roasted beef brisket (which was a bit tough) with the 2006 Leoville Poyferre worked marvelously, as the acidity of the wine beautifully cut through the richness of the dish. I tried the beef with the 2008 Vega Sicilia as well and the 2006 Leoville P worked better due to stronger richness, texture and viscosity of the Bordeaux. On the dessert side the decadent chocolate fondant paired perfectly with the 1963 Graham’s Colheita Single Vintage Tawny Port, adding a nutty and cartelized character to the chocolate. Finally, it is a rare sitting that I have the opportunity to take in the indulge in one of the premier Scotch whiskies available on the retail market, the stunning Royal Salute 21 Year Scotch. I fondly remember a night more than a year ago where I tried some of this seductive elixir with one of my close friends and was amazed by the incredible range of its aromatic and flavor profiles. Sampling a touch of this stunning scotch takes me back to this wonderful moment which was more than a year ago. Toffee, peat moss, cigar ash, caramelized melon were a few of the intoxicating delicious flavors that I can’t get enough of. We enjoyed this treat in the bar area as we slowly made our way to Dubai. 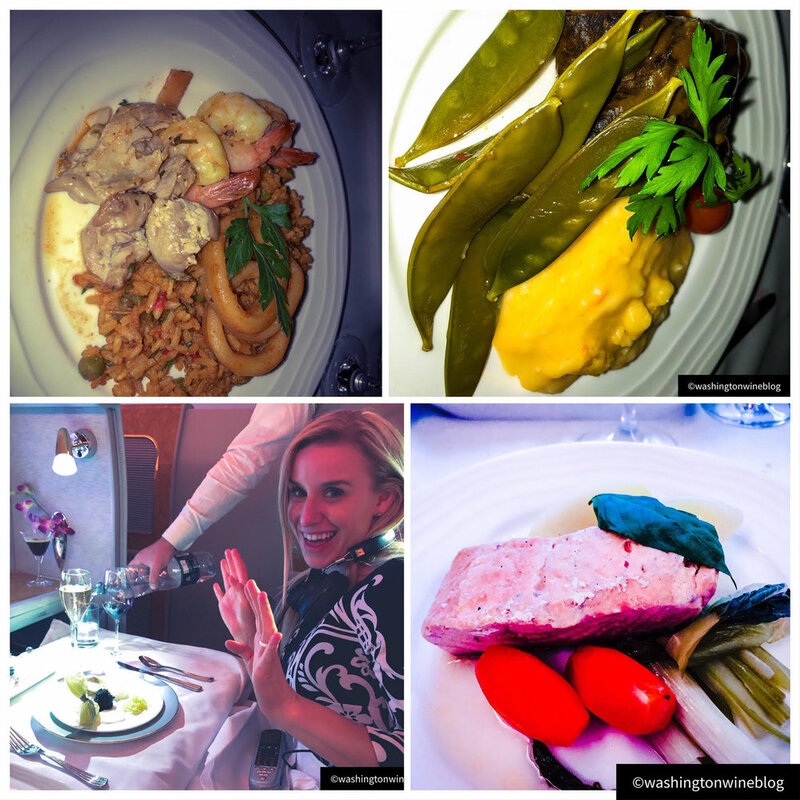 It was a culinary delight flying in my First Class Emirates flight from mainland Europe to Dubai. For wine lovers, it is particularly enticing being able to sample some extremely hard to find aged bottles at twenty thousand feet. The service and attention to detail on these flights is extraordinary as this is truly a one Michelin star experience high above the clouds.